Serving stuffed cabbage is a common dish for Simchat Torah. The recipe I share with you is from a dear friend–like a family member–who lives in Tel Aviv. I have had countless Shabbat and holiday meals at her home. 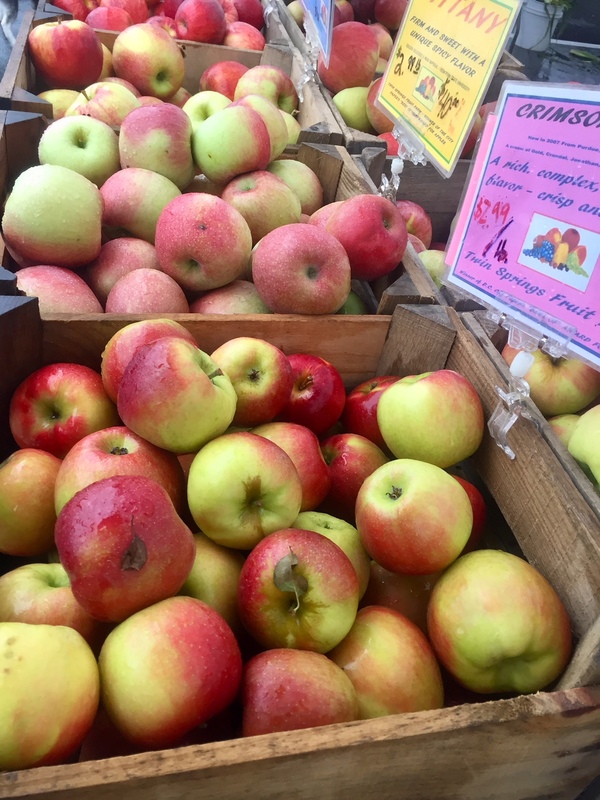 Whether in the kitchen or dining room, the tables are always inevitably overflowing with dishes that she painstakingly prepared over a few days after spending hours picking out and discussing with the shopkeeper about the most beautiful produce at her local tiny fruit and vegetable market. Mindful of my plant-based diet, she not only would worry that I have enough to eat, but also creatively updated some of her meat dishes to be vegan. 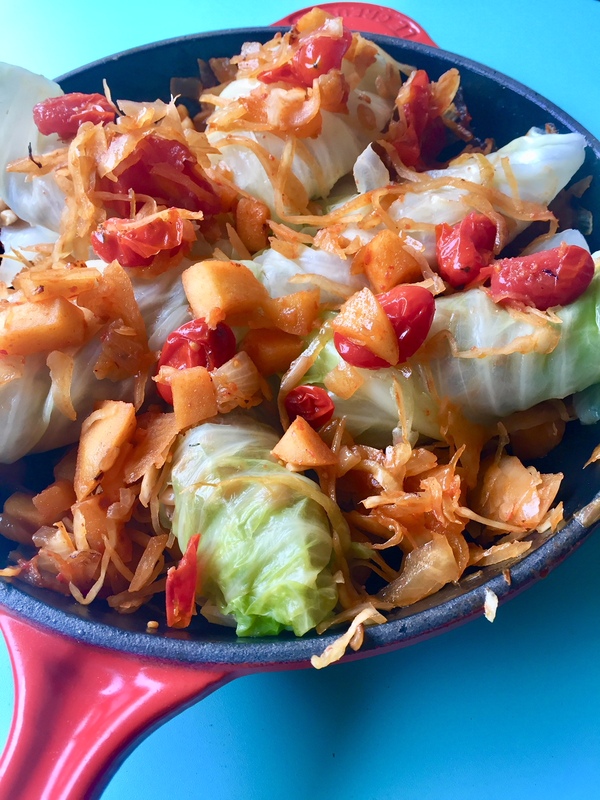 I have had this incredible stuffed cabbage dish at her home many times and every time she excitedly and proudly presents it on a platter to guests. I humbly present my best attempt to try to recreate her delicious recipe. While researching why stuffed cabbage is served on Simchat Torah, I found a lot of interesting explanations. Beyond the obvious that the stuffed cabbages look like Torah scrolls and the holiday celebrates the giving of the Torah, there’s interesting wordplays and seasonal foods and cultural adaptions. 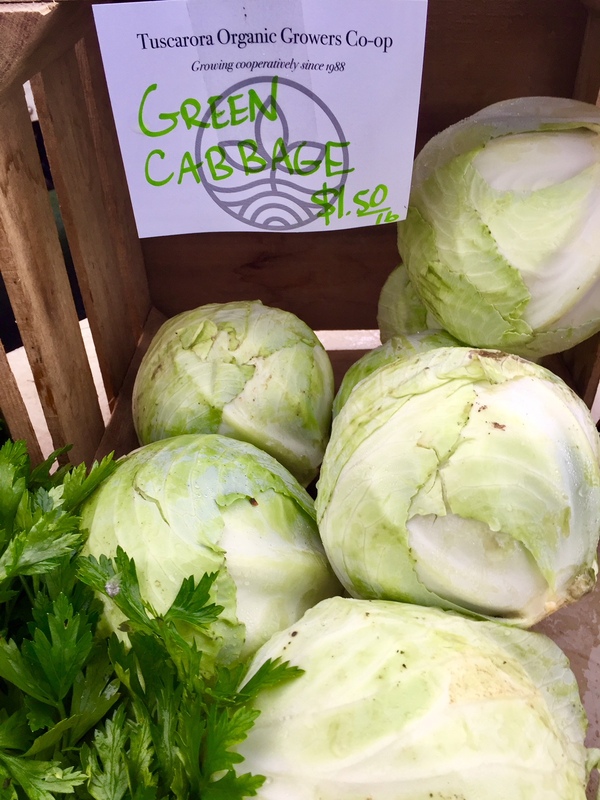 At the most basic and practical level, cabbage is widely available during the fall holidays. Stuffed cabbage was standard fare, stretching from Eastern European shetls to Persia, and adaption for kosher meals was easy. Jewish communities called it a dove because it resembled a bird’s nest (teibel in Yiddish). For wordplay: keruv means cabbage in Hebrew and includes the same letters as “blessed.” It is also the same word for cherub in Hebrew and the cabbage dish alludes to the cherubs that stood over the Ark of the Covenant. PS: Click here for my other Simchat Torah (and Shmini Atzeret) dishes. Cook two cups of rice or farro until slightly under-done. While cooking the rice, place the pine nuts in a toaster oven at 250 degrees Fahrenheit and toast until lightly browned. When the rice is finished, fold in the pine nuts. In a large skillet on medium, add one tbsp olive oil. Add onions and cook until brown. Add the chopped apple and cherry tomatoes. Mix well. The tomatoes will eventually start to fall apart. Just before the sauce is done, add the sauerkraut and mix well. Add salt and pepper to taste. Optional: If you prefer the sauce to be sweeter, add chopped dried prunes at the same time as the apples. Once the cabbage is completely cooled, gently peel off leaves. 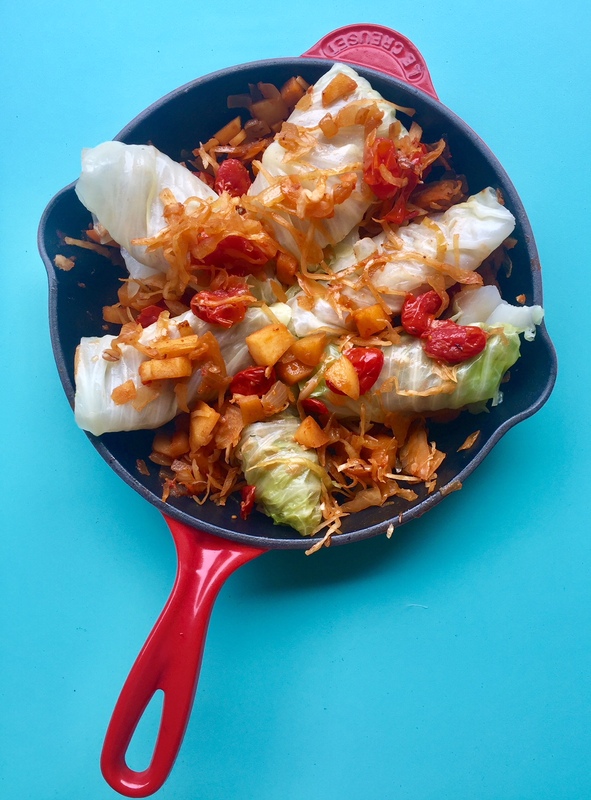 Add tablespoons of the rice mixture to a single cabbage leaf and carefully roll. Add the stuffed cabbage leaves to the sauce mixture in the pan and cook together (this is why the rice should be slightly undercooked), for several minutes until warm and rice is soft. 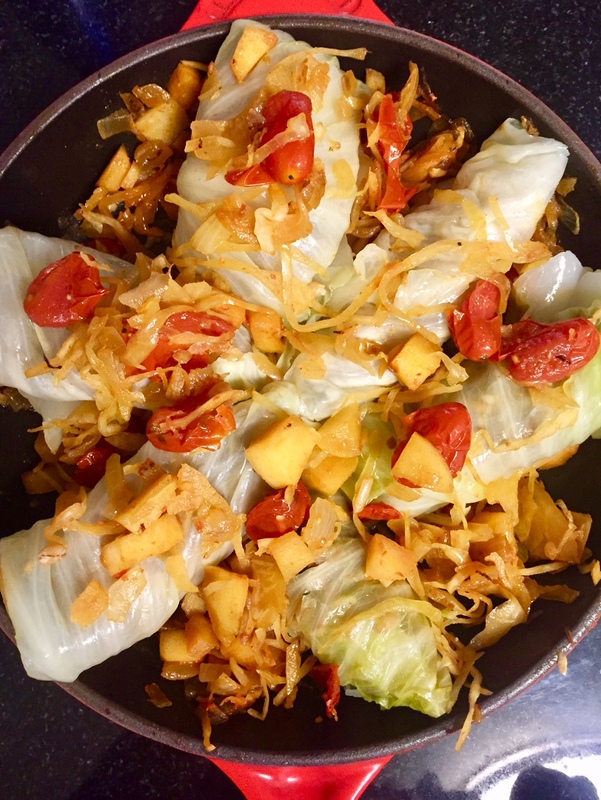 This entry was posted in Entree, Holiday, Side dish, Simchat Torah, Tishrei, vegetable and tagged cabbage, cooking, food, Holiday, Jewish, plant-based, Simchat Torah, stuffed cabbage, vegan by Sarah Newman. Bookmark the permalink.